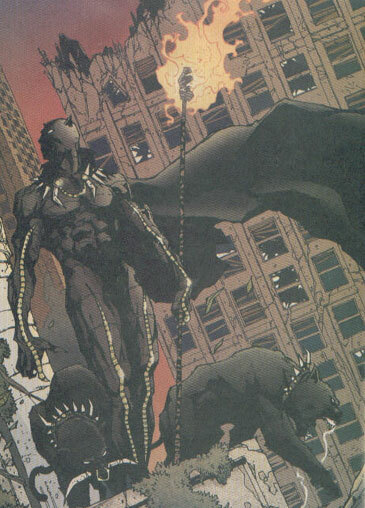 Powers/Abilities: The Black Panther had the same enhanced strength, agility, and vision of the Earth-616 Black Panther. He also carried a torch and had two black panthers at his disposal. History: (Marvel Universe Millennial Visions 2001 - "Black Panther: War of the Kings" (fb) - BTS) -The Black Panther was brought into the Avengers to fill a government quota. (Marvel Universe Millennial Visions 2001 - "Black Panther: War of the Kings" (fb) - BTS) - Due to speculated events that either involved a superhero feud or a standoff with Doctor Doom, the Black Panther and the Sub-Mariner became enemies. The first attack involved the Sub-Mariner flooding the Wakandan capital city, causing it overgrow with vegetation. The Black Panther responded by sending aquatic Panther Tanks to Atlantis to destroy the throneroom of the Sub-Mariner. This event pushed the Sub-Mariner to unleash monstrous sea beasts on the now-flooded Wakandan capital which led to more strikebacks from the Black Panther and eventually a war between the two kingdoms. (Marvel Universe Millennial Visions 2001 - "Black Panther: War of the Kings") - The Black Panther patrolled the flooded Wakandan capital as the Sub-Mariner dug through his destroyed throneroom swearing revenge. Comments: Created by Bill Rosemann and Alberto Ponticelli. Black Panther, Azzari the Wise, Black Panther of the 1920s-1930s, created paradox of techno-jungle, @ Black Panther I#?